Do you go organization crazy in the New Year? I can’t say that I do, but during the after Christmas clean-up I always find areas that I want to organize. However, I know it’s bad when my daughter says, “Hey, Mom, this drawer is super messy. Maybe you should clean it out.” Uh-oh. When that comes out of the mouth of a little girl who thinks Barbies all over the floor is acceptable, I know I need to take action. This particular drawer is in our bathroom. It’s a big drawer that the hubby and I share. Since he was off work for Christmas, I snagged some time to clean it out and pretty it up! 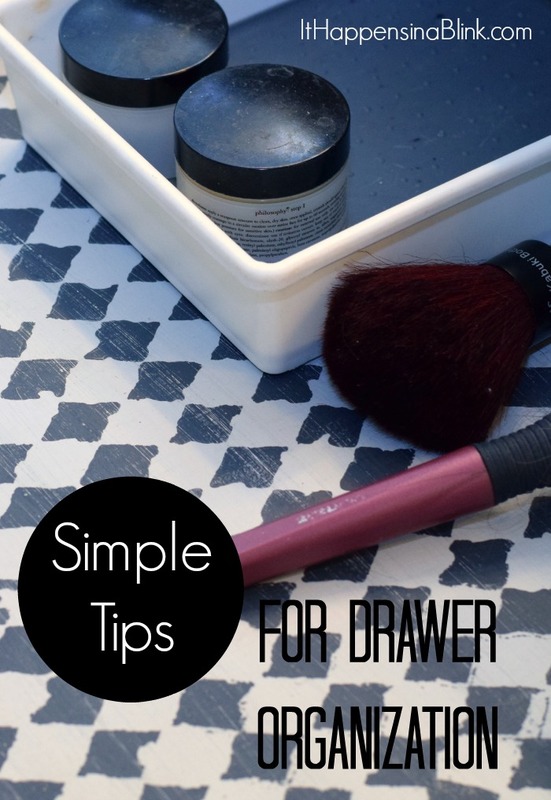 Today I’m sharing my Simple Tips for Drawer Organization. These tips aren’t complicated. They may be things that you do already. But if you can steal approximately ten minutes, you’ll have a newly organized drawer in no time! 1. First, I’ve never had luck with the rubber shelf liner. It works great for a few weeks, but then it bunches up and drives me crazy. I’ve tried to make it work many times over, but I finally decided to just get rid of it. 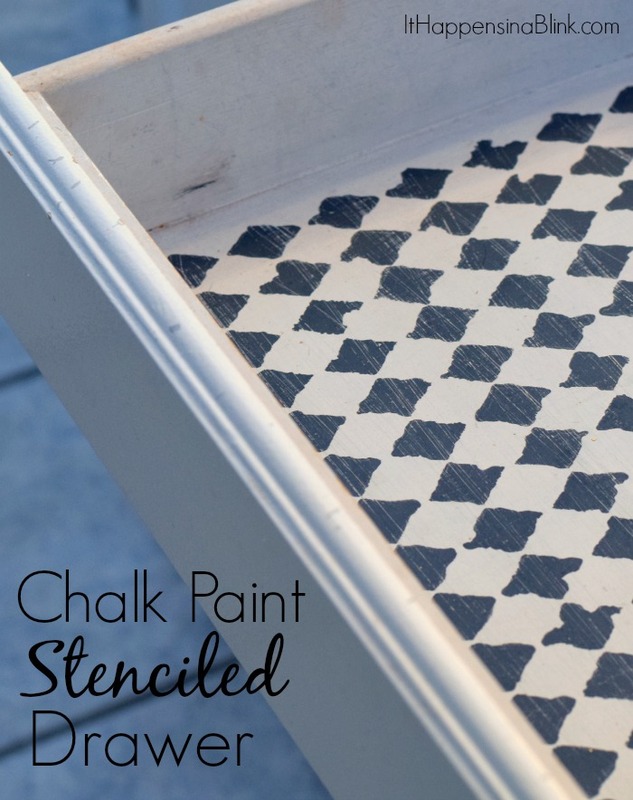 I replaced it with a chalk paint stenciled pattern covered with varnish in the drawer. 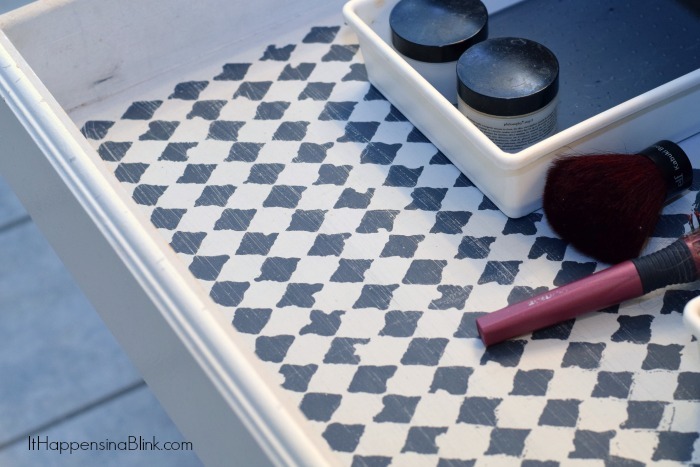 See the Chalk Paint Stenciled Drawer that I finished for the complete tutorial. 2. When trying to gain ground on drawer organization, it’s best to totally remove everything from the drawer. 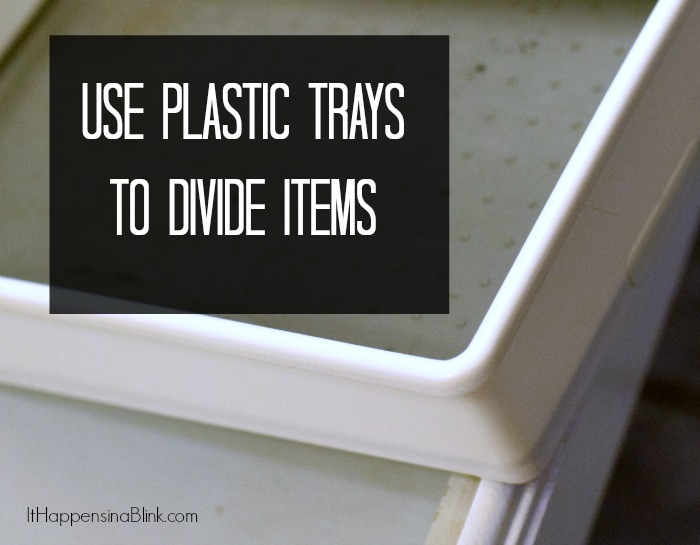 This will allow you to throw out anything that is expired or simply not needed. If everything isn’t removed first, there’s a big risk that you’re simply rummaging items from side to side. 4. Use little make-up bags to hold hair accessories. Do you have any of those little “freebie” make-up bags that you receive as special purchases with make-up orders? I seem to have accumulated a few over the years. 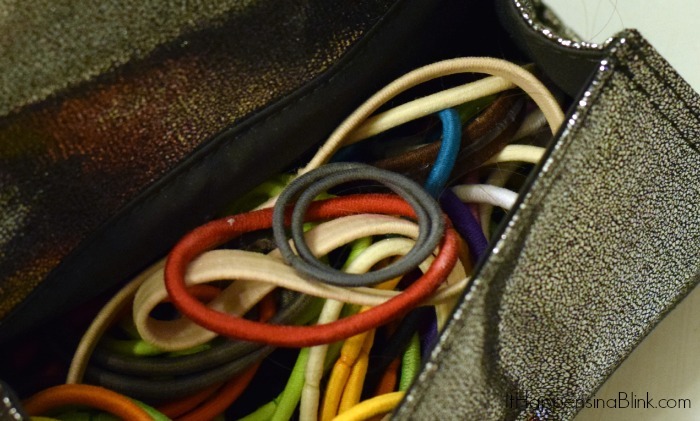 They made great bags for hair ties or bobby pins that tend to go rogue. 5. Find a place for everything and everything in it’s place. 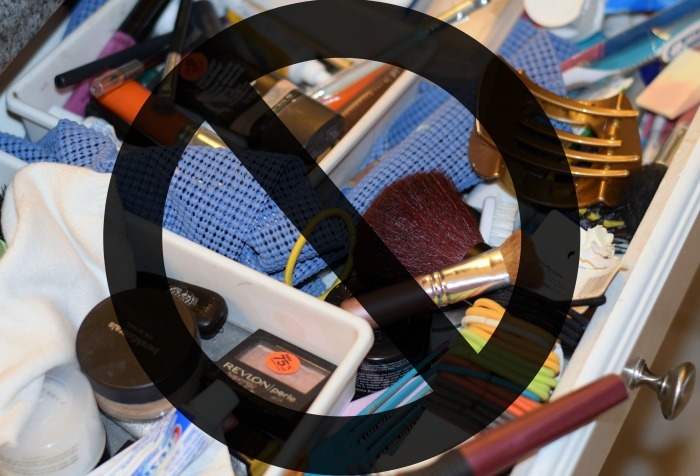 Put the basics back in the drawer and not things that “don’t have a home.” If it doesn’t belong in the drawer, find where it does belong and put it there. I hope you achieve all your organizational goals for the New Year!